At present, social media channels have an eminent part in helping a business to thrive. Most of the marketers use these platforms to reach their relevant customers faster. Next to Facebook, just after the inception of Instagram, it is enjoying great popularity which doesn’t seem to exhaust in far future. The platform has more that 200 million users on monthly basis. In the present scenario, 86% of the stalwart companies have their accounts and that’s a sharp rise of 71% as compared to the last year. Though this data makes it quite clear that Instagram has an enormous audience and that has an affirmative effect on your businesses. 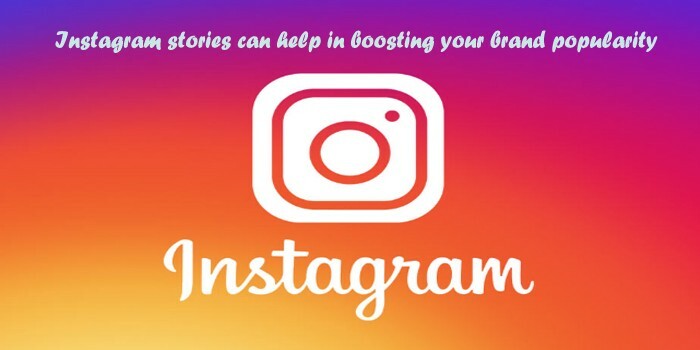 Apart from this Instagram stories feature can act as a boon for your business customers. Marketing industry is an arena that will typically need a strategy to promote your Brand Identity Design. The points provided in the next section will help you to some impetus to create a good strategy to market employing Instagram stories. As it is among the huge social media channels available, it offers your venture a great impetus in terms of potential customers and sales. But, it of course depends on your activities and interaction more than only from gaining more and more followers. Since Instagram is one of the biggest social media platforms available, it provides your business a huge growth potential. But this potential is based on the activeness of the interaction in your Instagram rather than simply gaining a massive number of followers. As per the review provided by Iconosquare, 70% of users search on Instagram for the brands. Apart from this, the most remarkable thing is Instagram enables you to influence the user’s decision-making process while buying goods or services without the hassle of thinking other complex techniques. As you have understood the essence of the platform for your brand benefit, the step should be making an impactful strategy with which you would be able to convince your target market or audience. Setting some easy goals reaching to the achievement of bigger goals will keep you focused and encouraged. Bio: This section should contain the precise details about your company to represent your brand in front of the clients visiting your profile. Profile Picture: Pictures have a great role to play apart from words in creating an impression, that we know. Find a photo that makes your business different from the other ventures. Link: It is more to think about which links you should use in the profile as the platform allows single link only to your profile.